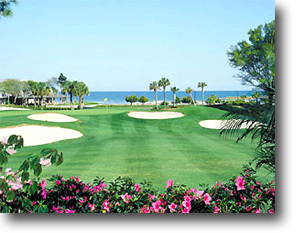 Myrtle Beach is one of the best places for playing Golf with more than roughly a million Golfers a year. This "mecca" for Golfers starts in Georgetown, South Carolina and ends in Southport, North Carolina. In between, there are more than 120 Golf courses where you can play Golf. Enough for very long and relaxing Golf holidays. Spring and fall are prime time for Golfers, with courses in tip-top shape and ocean-fueled breezes keeping temperatures perfect. In winter, sweater and wind shirt are enough and it is possible that you have top 100 courses in Myrtle Beach practically for yourself. The second-oldest course is the "Tidewater Golf Club And Plantation" which was ranked by Golf Digest as its "Best New Public Course in America" in 1990 and is still No.1 at Myrtle Beach. This course is No.39 among Golf Magazine`s "Top 100 You Can Play" list. There are bent grass and multiple tee boxes, pine-lined inland holes and spectacular holes built along the Intracostal Waterway with views of nearby Cherry Grove Beach. "Caledonia Golf And Fish Club" belongs to the "Top 10 Places to Play" (Golf Magazine) and Golf Digest say "Fifth Best Public Course in America". No. 18 is really the best hole on this dramatic course. This par 4 ends at the clubhouse, with water on the right side in front the wonderful green which is protected by bunkers front and back and features a ridge down the middle. 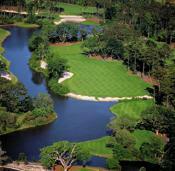 Golfers have their choice of four courses at the "Barefoot Resort", opening in 2000. Each is named after its designer: the Pete (Dye), the Tom (Fazio), the Greg (Norman) and the Davis (Love III). Tom`s course contains water on 15 holes and there are plenty of sand and waste areas. Hole No.13 is a par-4 with two greens, extensive bunkers and a sand waste area. Greg`s course is a very natural one. Vegetation and waste areas are around the holes which reminds to a desert. In fact - there is none. The little par-3, No. 10, is a lovely hole with the Waterway in the background. The Davis` course contains a lot of fun. Nearly every hole sports a generous landing area. The Golf course reminds to courses in Scotland and Ireland because of the surrounding. 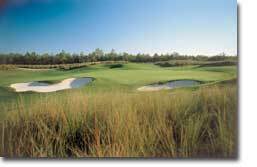 Also one of the best courses is the "Tournament Players Club of Myrtle Beach". It belongs to "Top 10 Best New Upscale Public Courses" in 1999 and is ranked among " Top 20 New Courses To Play" by the Golf Digest. This wonderful Golf course is the home for the PGA Senior Tour Championship and was designed by Tom Fazio and Lanny Wadkins. The first nine holes are very sandy while the last nine holes features extensive water. This is only a small selection of all these fantastic and lovely Golf courses. There are much more where you can spend your vacations. 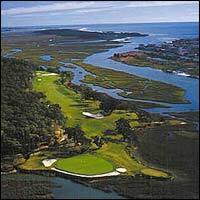 True, there is much more than Myrtle Beach Course Golf: There is the Atlantic Ocean coastline where you can enjoy sand, sun, surf, hundreds of restaurants and much more.